the building, please call us and we will make arrangements to meet you upon arrival. Parking is located in two areas near Memorial Union. If you are turning onto University Ave. from College Ave., you will take the first driveway on the left side. This drive will take you back behind the Memorial Union building. If you are turning onto University Ave. from Hitt St. or Ninth St., turn into the last driveway on the right, heading towards College Ave. In this parking lot, there are metered and handicapped parking areas. Metered areas are $1 per hour. 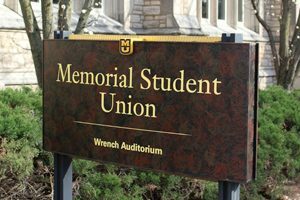 There are accessible parking spots located in the back of Memorial Union. If an accessible spot is not available, feel free to park in one of the other metered parking spots with your handicap tag visible. Visitors do not have to pay the meter if your hangtag or your license place has the handicapped symbol visible to the MU parking and transportation employees. Automatic doors and ramp access are available on the east, north and south sides of the building. If entering on the north side, there is an elevator located on the first floor between the stairwell and the food area, which will take you to the lower floor.